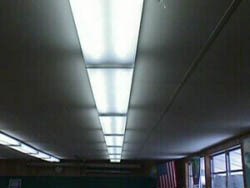 The portable classrooms have T12 lamps with magnetic ballasts. These types of lights put out a great deal of heat and are less bright than the T8 lamps with electronic ballasts. Below are the infrared thermographs of the lights in portable 035. The temperature range is 75.2° F (darkest colors) to 93.2° F (lightest colors). The heat given off is evident by the bright whiteness of the lights. With the same temperature range, the above infrared thermograph demonstrates how much cooler the T8 lamps are when compared with the T12 lamps. The blue-violet colors are striking in contrast to the bright white above. Above are thermographs comparing the lighting systems in the portable classrooms. The thermograph on the top is from portable 035 with the efficient T8 lamps with electronic ballasts. The temperature range is 72.3° F (darkest colors) to 90.5° F (lightest colors). Right are the T12 lamps with magnetic ballasts from portable 096. The temperature range is 80.5° F to 89.5° F. It is obvious that the T12's run much hotter being white-red while the cooler T8's are green.